From left to right are County Executive Mangano, retired FDNY firefighter Ray Pfeifer, and Legislator Rose Marie Walker. 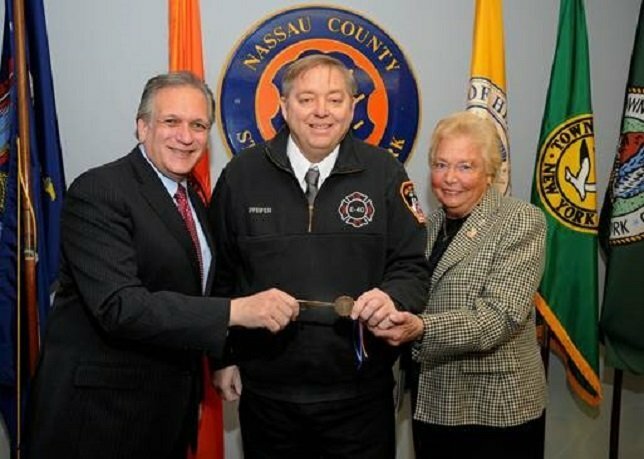 Nassau County, NY - January 25, 2016 - Nassau County Executive Edward P. Mangano, along with Legislator Rose Marie Walker, today presented a “Key to the County” to Ray Pfeifer, a retired FDNY Firefighter and a member of the Hicksville and East Meadow Volunteer Fire Departments. Ray spent eight months working at Ground Zero in the aftermath of the 9/11 attacks, which resulted in a diagnosis of stage-4 cancer that was linked to his time there. Despite his diagnoses, he traveled to Washington DC to advocate for his fellow firefighters and 9/11 responders for an extension of the Zadroga 9/11 Health and Compensation Act—a law named after deceased NYPD Detective, James Zadroga, that insures health coverage for sufferers of Ground Zero illnesses. Ray’s dedication and determination in fighting for the Zadroga Act resulted in the extension of the health care program until 2090. Ray served in the FDNY, Engine 40, Ladder 45, for 27 years. His father was a volunteer firefighter, and his 23-year-old son Terence currently serves as an EMT for the FDNY. Subject: LongIsland.com - Your Name sent you Article details of "Mangano Presents Key To The County To Retired FDNY Firefighter And 9/11 First Responder"